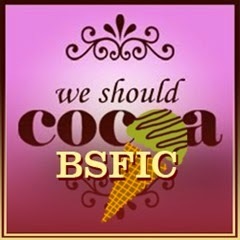 This month We Should Cocoa teamed up with Bloggers Scream for Ice Cream (BSFIC) for an icy chocolate extravaganza which is #WeShouldBSFIC. January may not be your favourite time for eating ice cream or other frozen treats, but some of you hardy souls rose to the challenge with enthusiasm. Hop over to Kavey Eats to see her round-up. Look out for next month’s #WeShouldCocoa with Katie, over at Recipe for Perfection. Apparently we told Elizabeth, over at The Law Student’s Cookbook, that she had to make ice-cream, so she did. I didn’t know we had that much power. Being a fan of all things Nutella, she decided NOT to use it and go for chocolate hazelnut ice cream using roasted hazelnuts instead. Over at Honey and Dough, Hannah has a little doughnut sitting on her shoulder, apparently! Well actually I think I have a little brownie sitting on mine. I suspect it’s not the same brownie Hannah used to make her frozen crème fraîche and brownie custard. I am very excited about the use of crème fraîche not to mention the brownies of course. Janice from Farmersgirl Kitchen has presented her white chocolate Eton mess ice cream in a very stylish cup and saucer, which I am now coveting. I’m rather wishing I could dig into the ice-cream too – made with strawberry purée found in the freezer, it’s a real taste of summer. I had a go at making mini chocolate ice pops. Well the chocolate may not have looked quite as slick as I’d have liked, but my goodness they were good. Chocolate milk ice covered in thick dark chocolate – I think I’ll have another one. I’ve not tried ice-cream sandwiches before, but having seen these mini triple chocolate ice cream sandwiches over at Jo’s Kitchen, I am seriously tempted. Jo’s home-made chocolate ice cream contains chocolate chips and is then sandwiched between chocolate biscuits – wow! In case you missed it, it was Australia Day last Monday and Johanna over at Green Gourmet Giraffe marked it by making Violet Crumble ice-cream. I’d not heard of Violet Crumble until I read the post. It is not, as I first thought, a crumble pudding flavoured with violet, but an iconic Australian chocolate honeycomb bar. Julia, over at Something Missing, also made a no churn ice-cream, but a rather different one to the condensed milk one we all know and love. Her birthday cake ice cream is made using a base of Italian meringue – most intriguing. Even more intriguing is the cake batter used to flavour the ice-cream. I’m a big fan of cookie dough ice-cream, but I hadn’t heard of cake batter ice-cream. The Big Spud describes his chocolate and passion fruit baked Alaska as a showstopper and he isn’t wrong. The flavours and colour contrasts are just too tempting. And finally we have Kavey’s very own rich, dense & dark chocolate ice cream over at Kavey Eats. Wow, all I need is the title of this to make me go week at the knees. The ice cream is another no-churn version which I’ve not come across before – it’s all very exciting. Well done to all those who managed to create such wonderful ice creams this month! I am afraid I woosed-out and have buried myself in stews and hot things. I am fascinated by an ice cream made with Italian meringue though…… I will definitely be exploring that further!!! Loads of tempting recipes here! I just bought an ice cream maker last month, and it changed my life! Never going back to store bought ice cream again. Can’t wait to try these out! Home made ice-cream is a completely different beast Katie. I’ve never tried an ice cream maker, but I expect it makes life a lot easier – have fun. Hooray, glad to be of service. It worked in your favour this time around Johanna and I’m with you on the cup and saucer. I’m with you there Janie – roll on summer and an excuse to indulge in the frozen stuff. I am all over that chocolate and passion fruit show stopper. I adore passion fruit too Bintu – it looks fab. An ice cream sandwich made with chocolate digestives? I would like to shake that person by the hand! Haha, I thought much the same CC. Sorry you can’t have the cup, it’s part of a family heirloom! The icecream was easy so I’m sure you could make it as soon as there are strawberries or maybe even with frozen strawberries. Dying to see the rest of the family heirloom now Janice. Thanks Kavey, it was fun. I just want to try everything now. They do look good Chloe. Food bloggers are a talented bunch. Mmmm ice cream! What a lovely round up! I especially like the look of GGG’s creation! What a selection! Ice cream and January don’t mix for me but my 5 year old would certainly strongly argue otherwise! They all sound so good (even in January!). What a nice round up and a great variety.